Located at an altitude of 2,000m, just 2km from the village itself, La Rosière Golf Course offers unhindered views over the Haute Tarentaise Valley. 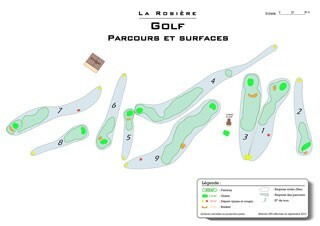 La Rosière is proud to boast one of the highest golf courses in Europe, with nine FFGolf-approved holes nestled in a natural setting amongst marmot burrows and myrtille bushes. The course is ideal for both beginners and experienced players. Its first holes were made in 1988, with the rest of the course’s nine holes being created seven years later. This stunning golf course roams over the high altitude pastures above La Rosière, and players can drink in breathtaking views of Mont Pourri, the Beaufortain Massif, Bourg Saint Maurice and the Isère Valley. Get into the swing of things right from the outset with the course’s second most difficult hole, which measures 173 yards with a slight uphill slope. Clever tactics are vital here, due to the tree sitting in front of the green, bunker to the left, and the natural terrain which slopes gently to the right. A bogey would not be a bad start! This short, downhill hole boasts one of the best views of the course, but make sure you stay focused! If you hit the ball too long, you are likely to end up in the bunker or out-of-bounds. This hole tends to throw up either birdies or double bogeys. La Rosière Golf Club’s oldest hole. If you manage a powerful drive, you should not have any problems on this hole, but if driving is not your strong point, beware of the bunker and the hillock 22 yards in front of the green.. The course’s longest hole, on a slight downhill slope and with a dogleg right. From the men’s tee, you need to drive at least 130 yards in order to reach the fairway, otherwise you will end up amid rough gorse or myrtille bushes! Slices are punished on this hole with out-of-bounds all the way along the right hand side. If you suffer a bad start to this hole, you’re unlikely to make a par! Don’t let yourself get carried away by the thought of a birdie on this, the easiest hole of the course: you still have a bunker and small hillock just in front of the green, plus some tricky putts, to tackle first. Providing your wedges are on form, a par should be easy. Your efforts to hike up to this tee will be rewarded, so take the time to drink in the outstanding views as you watch your ball soar into the sky towards the green. It’s much safer to aim towards the bunker on the right than to hit too long or to the left. Chasers of the hole-in-one have their chance to shine at this hole! Undoubtedly the most difficult hole of the course, not just because of its length, downhill slope and small green, but also due to the absence of fairway to the right and left hand side, the out-of-bounds behind and its tricky bunker to escape! Our tip: stay straight and short on this hole (a hole-in-one can be done) if you want to keep your score down. This hole is pretty straightforward, providing you do not shy away from driving uphill. Be careful, though: putt too hard and your ball could easily roll back off the green! Your best chance of a birdie is on this fairly short par-4 with a slight uphill slope. But don’t let your focus stray to the club house: one bad slice and your ball will go out-of-bounds or end up in one of the bunkers located 90 yards from the green!